There are 3 predominant investment classes in Australia where individuals place their hard earned; property, shares and cash. Bonds are a less common 4th option but rarely taken up by individuals and often considered another form of safe haven like cash. Traditionally however, gold and silver are the more accessible ‘safe haven’ investment, and by ‘tradition’ we are talking thousands of years. An unfortunate fact is that many ‘financial advisors’ will always favour financial assets over hard assets. Sometimes it is simply what they ‘know’, but often it is through the enticement of upfront and trailing ‘commissions’ that come with many financial asset investments. The reasons for holding gold and silver are also often counter to their message. Gold and silver bullion also work on very slim spreads with no commissions and therefore offering no such ‘kick backs’. It is therefore always worth doing your own homework to make sure you are doing all you can to protect your hard earned wealth. As a start to your own education it worth taking the time to dispassionately compare these options. A fundamental concept often lost on many investors is that buying shares (equities) is you buying the future earning potential of that company and its management. The important thing here is future, not past performance. You are taking the view that the company will increase earnings in order to deliver capital gains through an increased share price and at least continue with current earnings to provide a yield similar to that provided now. There are of course many and varied nuances to this and there are broader market forces that can affect the share price irrespective of that company’s fundamentals. Perfectly sound companies get dragged down by a broader market crash. Since the GFC we have seen a split in the relative performance of the Australian and US sharemarkets. Australia, some 7 years after the GFC is still nowhere near the peak reached prior to the GFC as the economy, in general, struggles in the post Mining Boom era with relatively moderate market intervention by our central bank, the RBA. Growth outlooks for Australia are subdued and any investor must be careful about which shares they choose. In contrast in the US the US Federal Reserve launched an unprecedented monetary policy of ‘printing’ over an incredible $4trillion and held rates near zero to stimulate growth. The sad fact is that most of that stimulus simply inflated shares rather than the underlying economy, with shares subsequently reaching well above pre GFC levels. With high price/earnings ratios more and more investors are querying the fundamentals of current prices. At the time of writing you would be hard pressed to find even the most bullish analyst suggesting shares are ‘cheap’ in this environment. In the modern ‘zero’ interest rate world many are turning to higher yielding shares whilst understanding there may be limited capital gain. The only consideration there is the value of earning 5% per year compared to losing 50% of your capital value when the crash comes. In terms of ‘balance’ it is important to remember your Superannuation. If you are in a managed super fund you will likely be very heavily weighted into equities already. It is definitely worth considering starting your own Self Managed Super Fund (SMSF). Learn more about that HERE. Finally, in the context of this comparison it is worth noting that more than any other investment, shares involve substantial counter party risk. You are investing in a management team and their growth strategy. You outlay funds and receive a paper certificate. It is fair to say Australian property prices have the rest of the world somewhat perplexed. Our prices as a ratio of income are incredibly high by world standards. Courtesy of the China induced mining boom we relatively cruised through the GFC and didn’t see the property price correction experienced around the world. Low interest rates since the GFC introduced to stimulate risk and debt consumption have driven up demand and hence prices, and subsequently seen a lot of recent talk of a bubble forming, particularly in Sydney and Melbourne. The difference this time is our banks have gone on an overseas debt binge since then. Another major banking crisis could see a very different outcome in Australia next time and it is predominately housing finance at risk. Property relies fundamentally on population growth and it has been robust on the back of our outperforming economy. With forecasts of a struggling post mining boom economy it is yet to be seen if we will see that same population growth going forward. Property is always about the 3 P’s and now more than ever picking the right market is critical at these elevated prices. 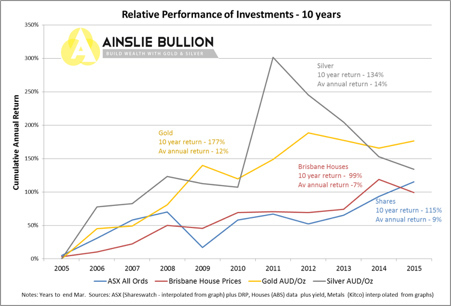 There will likely still be some sound investment opportunities in property out there and like gold and silver it is essentially a hard asset and therefore has limited counterparty risk… once you own it, not the bank. If you are an owner occupier remember your own home when considering the balance of property in your portfolio. Intriguingly many seem to discount this as an ‘investment’ when it is often your largest. At the time of writing this the cash rate in Australia was just 2% and you’d earn in the low 2%’s in interest in a bank. Take off tax and of course inflation and you are going nowhere. What few realise too is that as a cash depositor, you are an unsecured creditor of the bank. Put simply if the bank goes down they can take your money if the Government doesn’t bail them out. On that point one should take seriously the resolution reached at the Brisbane G20 around ‘bail in’ legislation being introduced whereby, ala Cyprus, the Government as a matter of policy won’t step in and the creditors wear the loss. In an era of unprecedented global debt this can’t easily be dismissed and the existing Government deposit guarantee scheme does not come close to covering a multi bank failure. Greece is also a contemporary reminder of the dangers of having cash in the bank. That said there are plenty prepared to take that risk and have substantial cash holdings waiting for what they perceive to be an imminent financial markets crash and the resulting ‘bargains’ to snap up. There is certainly merit in such an approach as long as the risks are understood. Gold and silver bullion is a hard asset and is often considered a ‘safe haven’ investment as precious metal bullion tends to be uncorrelated to financial assets such as shares and even property. The most recent example was during the GFC when shares literally halved and gold doubled in respective prices. Indeed the table below illustrates quite clearly what happened in the 5 worst years on the ASX in the last 50 years. (note the GFC straddled 2 years hence the table ‘only’ shows 40% loss for 2008). The biggest hurdle for many in buying gold and silver bullion is the fact they don’t provide a yield. That is absolutely true so always compare ‘total return’ when comparing it to other assets. In the last 10 years lack of yield has not mattered, the total return has still outperformed shares and property in most regions. The graph below shows the relative performance of each class (excluding cash of course) with Brisbane house prices including rental yield and Shares including a nominal dividend yield. We’ve mentioned counterparty risk a couple of times and this is another key benefit of holding gold and silver bullion… there is none. To be clear though this only applies to you holding physical bars or coins of gold and silver bullion, not Exchange Traded Funds (ETFs) such as GLD and SLV or futures contracts. In both of the latter you have clear counterparty risk as you are relying on someone else’s promise to have that gold and silver to back up the paper instrument you bought. For more information on the reasons to consider holding gold and silver as an investment click HERE.